Every November, the Movember Foundation encourages people to sign up on their website, spread the word about men’s health, and collect donations from friends and family (mustaches are optional). The Movember team wanted to create a more personalized and visual email experience to help Movember participants meet and exceed their donation goals. Since the campaign only lasts for one month, the campaign needed to contain share-worthy email content that drove people to act fast. 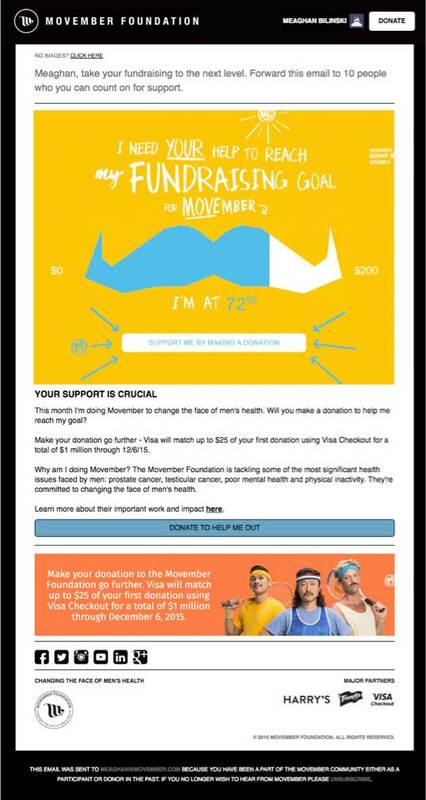 Using personalized visual experiences, the Movember team sent an email that contained live fundraising information. Movable Ink enabled Movember to display the fundraising total in the shape of an on-brand moustache that would automatically update in real-time as donations increased, so email recipients always received the most up-to-date totals. Live content gave us a fun new way to bring fundraising targets to life, and we saw a significant increase in the effectiveness. The email felt extremely personalized and relevant to the initial recipient and everyone who received it via a forward.